SANYO's eneloop Series Expands with New-Type Batteries Featuring high capacity “eneloop pro” and safer “eneloop plus”! 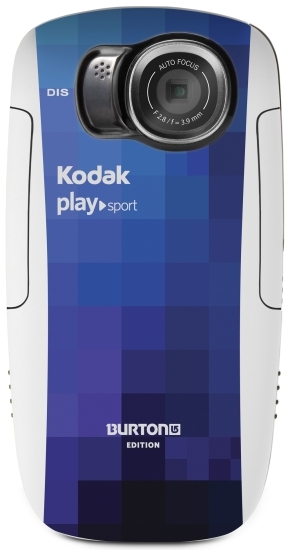 Rochester, N.Y., August 23 -- Eastman Kodak Company (NYSE: EK) today announced the launch of the PLAYSPORT Video Camera: BURTON Edition/Zx5, designed for people that love snow, and live for another run. This robust pocket video camera will meet the demands of even dedicated boarders, capturing all the best moments of a day on the mountain, no matter the weather. The durable, pocket-sized HD digital video camera captures those epic runs in full 1080p HD video or 5 MP stills. Video can even be recorded at 60 frames per second which is perfect for slow motion or stopping the action. The BURTON-branded PLAYSPORT Camera bundle comes with an HDMI cable, remote control, 4GB SDHC memory card, a gripping tripod and carry case. The camera will be available in Custom Blue for US $199.95 MSRP this fall at major retailers and Kodak.com.